Beaumarchais: The Scoundrel, directed by Edouard Molinaro from an unpublished play by Sacha Guitry has a Cyrano-like panache to it and is mostly quite enjoyable—though it is still worth remembering what Fabrice Luchini, in the title role, says to Manuel Blanc, the star-struck young Gudin who complains that the actors are pronouncing his words too quickly. “This is not Voltaire or Marivaux where you have to think about the words,” says the playwright of his own play, The Barber of Seville; “these words need to be pronounced quickly.” The same is true of the film. It does not do to look too far beneath the glittering surface, for the glittering surface is the reason why the film is worth watching. 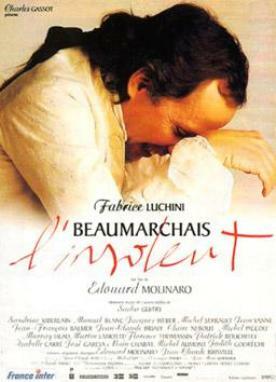 As spectacle, that is, it is superb, and Luchini does a marvelous job with the dashing poet and playwright, Beaumarchais, who is as much of a scoundrel as is necessary for a critic of royal absolutism to survive in the corrupt world of the French court and capital in the 1770s and 1780s. He is repeatedly imprisoned for his writings and is embroiled in lawsuits with various aristocrats while sitting as a judge over others. On one memorable occasion, the Duc de Chaulnes (Jacques Weber), whom he has cuckolded, attacks him in his own courtroom and they fight a duel which ends inconclusively as Beaumarchais is arrested yet again. If the film were not so fast-moving, I would say that it tries to do too much—as Beaumarchais himself did. The passages showing him acting as a secret agent in England for Louis XV and flirting with a strange, cross-dressing spy calling herself the Chevalier d'Eon (Claire Nebout), or running guns to the American colonists in their rebellion against the British or trying to dun Benjamin Franklin, in his bath, for payment for the guns, would seem to take us too far afield. But the pace is so fast and the touch so light that it makes sense that this embodiment of French esprit should be involved in so many disparate intrigues. Yet it is fair to say that his domestic relations with the lovely Marie-Thérèse (Sandrine Kiberlain) are far too sketchy. Where does she come from? At their second meeting she swears eternal devotion to him, and he seems quite happy to accept. The next thing we know they are an old married couple, and the scoundrel is sneaking in late at night after his trysts with other women. Marie-Thérèse gets together with Gudin to complain about the man they both love: “I thought he was faithful; you thought he was rigorous. We were both wrong.” Later she takes revenge on him by sleeping with Gudin, but Beaumarchais is philosophical about it, saying that if he is imprisoned again Gudin can look after his wife. The best thing about the film is that it is not preachy or sanctimonious about its politics. Both the Louis, XV and XVI, are believable if not sympathetic monarchs and treat Beaumarchais more as a naughty schoolboy than as a dangerous subversive. It would doubtless have been easy to show some poor peasants being ground under the royalist heel, but it would have struck a false note in such a film as this. For whatever the benefits of the Revolution of 1789—in which, we are told here, Beaumarchais's Marriage of Figaro was the first shot fired—it is scarcely possible to see it, in the Hollywood way, as a contest of good and evil. Perhaps the film's best moment comes as Beaumarchais is trying to persuade Louis to support the American colonists against the British crown by telling him about the Declaration of Independence. “What does it say?” asks Louis rather nervously. “That the people's most sacred right is—” and he pauses, “the pursuit of happiness.” For just a moment there is a gleam of understanding and eagerness in the unhappy king's eyes—until he realizes that such happiness is not for him. It would be a moment to be savored, if this delightful film savored any of its moments.